This morning I'm drinking Florida Avenue Blueberry brewed by Cold Storage Craft Brewery in Tampa, Florida. The first thing I thought of was this storage place over on Dykes Road that will store your wines and beers in a temperature-controlled environment, but that's not who brewed this. Ed Roberts brought back four great Cigar City beers from Tampa last week for me, including Hunahpu, but I decided to go with this one first! It is 10:15 am after all. (If you read yesterday's Cigar City Bohr review and are questioning my time line, don't. I drank this one before that one, just posting out of order). 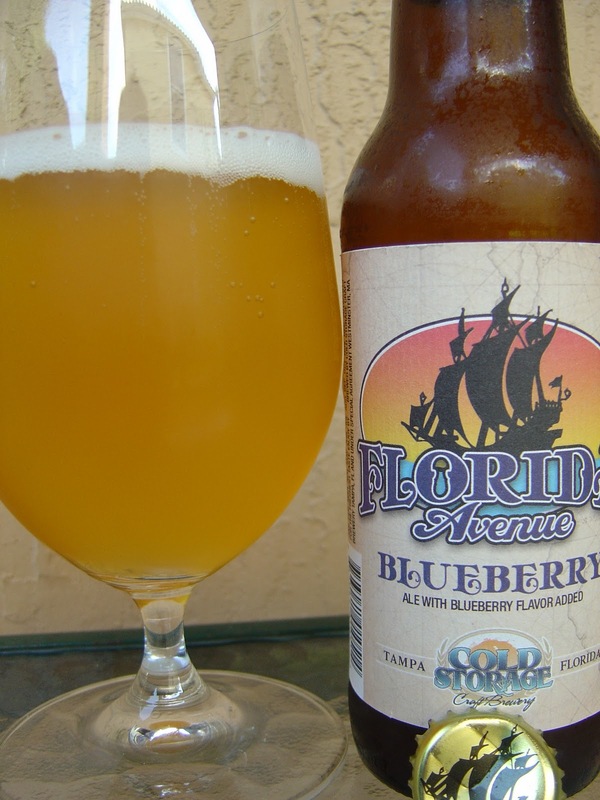 The label uses the phrase "perfectly balanced blueberry aroma and flavor" and what appears to be a tagline: "Treasure the Flavor". The label depicts a large pirate ship, what I am going to call a schooner despite zero boating knowledge. Just tell me when to drop my line is all I know! Finally, I think these guys have their notch machine backwards as neither 2012 nor 2013 is marked, yet there is an errant one by the bar code. As it stands, enjoy by May, No Year. I did get out my ruler and measured March, 2012 if it were turned around, which makes perfect sense! Either that, or the year is 2011 which isn't available to notch. Who knows? Faint berry aroma, and also a bit flowery and perfumey. Tart blueberry flavors kick things off, with just a hint of sugary cotton candy. Not overdone at all. There is also a wheat texture. Hoppy with good balance, not really sweet at all. Solid carbonation. Pretty simple and the flavors are not standouts, but not a bad beer at all. Very refreshing and not overly fruity. I'd drink this again for sure.